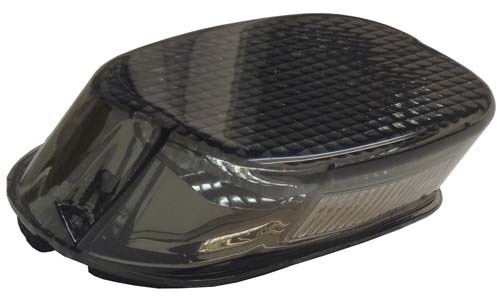 Our Harley Davidson smoked laydown LED tail Light are a direct replacement of the original stock tail lights, they are complete units including lens and a Radiantz LEDs cluster and plate light. These NEW LED taillights feature our 136 dual intensity LED cluster and 3 white LEDs. The taillight is a plug and play, just remove your stock taillight and plug in the new LED tail light. These LED tail lights come with a 5 year warranty against LED failure. These LED Tail Lights are the Best Value on the Market! Simple and fast plug-in installation. Includes housing, connection wires and smoked laydown lens. Includes 136 RED LED lights and 3 pure white license plate LED lights on the bottom of the lens. Fits 1999 to present Harley Davidson motorcycles with stock Squareback OEM tail lights.